A few times over the years of posting thoughts and ideas and commentary and the occasionally rare criticism I have made the following remark: “My humble hat is stapled to my head.” It’s true…ok, perhaps not stapled but most assuredly Gorilla Glued on. I am always quick to deflect congratulatory statements from others, passing them off to the band members because, in my heart, I truly believe they are the ones who deserve the kudos. I’m merely the caretaker, the custodian, the one who guides the ship but doesn’t make it run. And yet, every once in a while a moment comes along in a person’s life when one has to remove the humble hat and take a bow. …bare with me, this will be challenging. On the afternoon of November 1, 2014 I received a phone call just as the band was marching under the West grandstands and heading to the pregame entrance gates. I looked at the number, didn’t recognize it, yet, against my better judgement, decided to take the call for reasons unknown to me. I had only a few minutes before the pregame show needed to start and there I was answering the phone. On the other end was Lois and Lou Tierno with the news that I was to be inducted into the 2014 Reading Buccaneer Senior Drum and Bugle Corps Hall of Fame. I was, perhaps for the first time in my life (or at least in a very long time) rendered speechless. I’ve been removed from the corps for years…24 to be exact. My time with the organization was a scant 8 years: 5 on soprano bugle and 3 as drum major. Not really a lifetime commitment as so many other inductees have made. But I suppose my contribution to the corps continued long after I departed by sending students to learn from them just as I did, and then those members going on to become staff members, just as I did. In retrospect I supposed I’ve always been connected to Blue in some manner. I do not speak much of my time with Reading–it holds a very dear and special place in my heart that is difficult to explain to those who have never been part of such an organization. 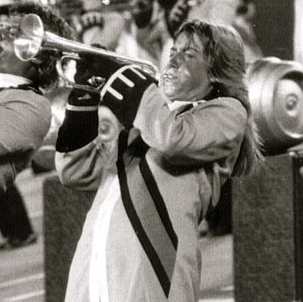 I was 19 when I joined–one heck of a cocky trumpet player who didn’t know that she didn’t know. I was fearless. Some might say the person I am today was “born in Blue”–a raw young kid who was shaped by so many gifted (and patient) instructors, who left before she was finished “cooking” but had the support in place to continue along the path on her own terms. I grew up in the Bucs, that is clear. I was “broken” there and then mended, molded and reshaped into something much more than I realized at the time. My mentors were many: Matt Krempasky, Darrell Weyman, Chuck Runkle, Glen and Andi Brumbach, Carol O’Brien, Amy (DeLong) Snook, Robbie Robinson, Ken Sherry, Ralph Pace, Jerry Kelsey, Ron Gehris, Grant Hill, and of course, George Parks (and so many others…and the moment you begin to name any you leave out ones you should have included so my sincerest apologies for that). I learned about family from my parents, aunts, uncles and cousins. This idea of family became more pronounced during my time with the corps. In turn it was enhanced and reinforced during my time at UMASS with George. But all those lessons and values and ethics did not crystalize until this kid simmered a bit more over the years, and began to pass on the lessons to my own “kids” at the University of Delaware. In the end, all I ever really needed to know I learned at Reading. I’m honored, humbled, and most grateful to be part of the 2014 Reading Buccaneer Hall of Fame. I could share stories for hours and hours about all the joys and tears of that time in my life. But that is for when we sit around the nursing home and not for this moment. And while it is bittersweet not to be able to share this moment with absent friends, I know they are standing on the deck of the ship we will all board one day when we will once again rule the seas, together. Aye me Buccaneers…for we are indeed, all good men. This entry was posted in General and tagged attitude, buccaneers, bucs, class, george-parks, gnp, hall of fame, heidi sarver, his, leadership, life lessons, reading_buccaneers, ud marching band, udmb, ummb. Bookmark the permalink.